In most cases, Victorian terrace houses need more than a simple refurbishment job. We will talk about a side extension to such a house here. 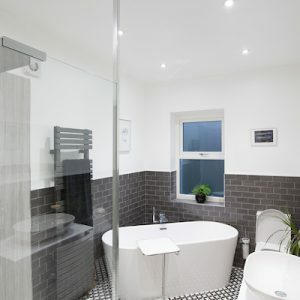 You usually want to make Victorian houses more modern while preserving the traditional chic feeling. 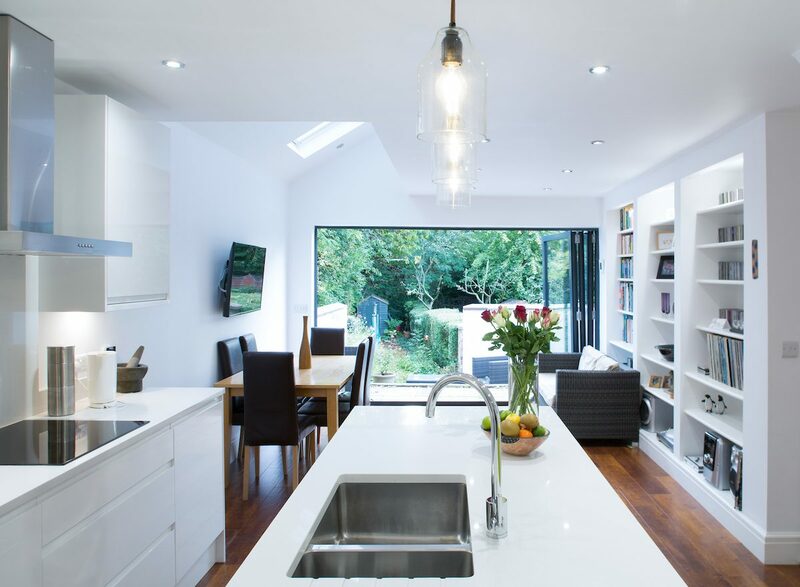 If you need more space, adding rooms and enlarge the floor plan is often possible. You want to be able to spend the day with your family in the nicest room after all. Ideally, it should overlook the garden and be bright and sunny. 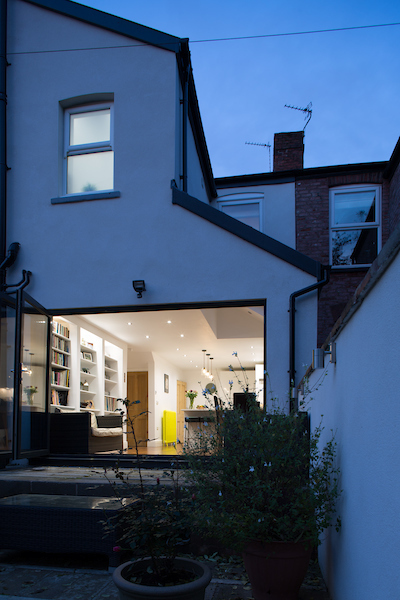 Gaynor and Jo had invited Magda – a Pride Road Architect from South Manchester – to design a side extension. They wanted to have an open space plan ground floor. However, they were not sure how it will work in terms of the layout Magda helped them get a clear picture. What didn’t work in the house for Jo and Gaynor? As in a typical Victorian Terrace House, the entrance corridor was very narrow. To enter the kitchen we had to pass through the living room. The kitchen itself was located in the back of the property. Small and dark (partly due to the colours and partly because of the window sizes). Jo loved to cook and be the part of social life while the guests were coming over. The kitchen wasn’t able to be the hearth of the house mainly due to its size and remote location. A side window from the living room overlooked neighbour’s wall. There was no perspective and no connection between the house and the garden. Slippery timber decking led to the lower part of the garden and there wasn’t any sunny elevated spot located high enough to catch the sunlight. There was a substantial height difference between the lowest garden part and the house floor level overlooking it. The positive side of it was the view and the downside was the lack of connection between the house and the garden. These issues are typical for many English houses. 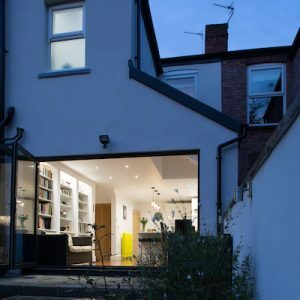 This Manchester Victorian terraced house side extension project started with a free initial consultation and later was followed by the concept design workshop. A concept design workshop starts with measuring the house. Once finished, we sit down at a table and start the design session. We draw various options in 1:50 scale. This enables the client to see, during the workshop, what new functions and layouts can be achieved. 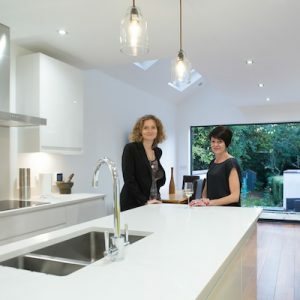 For Jo and Gaynor, the main question was how to remodel the downstairs. 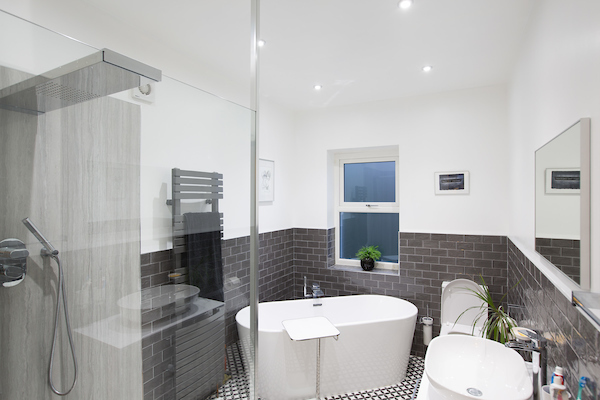 We looked into options with and without a downstairs toilet or utility room. We investigated locating it in between the two main downstairs rooms or opposite the cellar entrance. 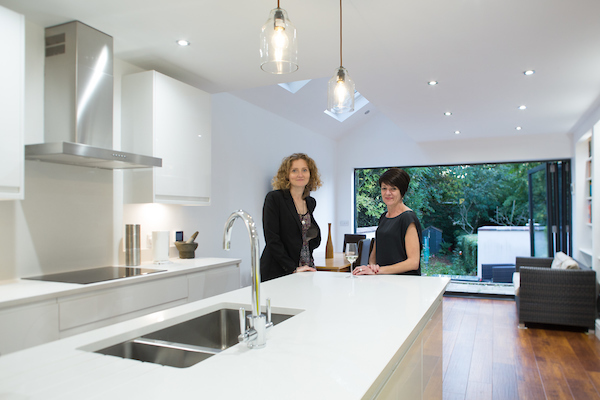 Jo and Gaynor saw various kitchen layouts that we drew and could develop it later with the kitchen suppliers. We discussed the different patio step options that allowed to raise up the outdoor table somewhere in between of the house and garden level. Upstairs only the bathroom was in need of transformation. We wanted to make it grander and more spacious. We achieved it by joining the toilet with a shower room. 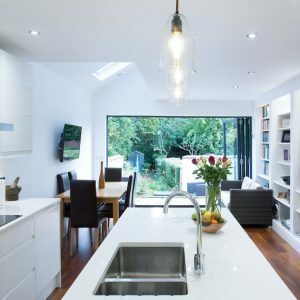 Additionally, we looked into the options of the loft conversions and its mezzanine variations. 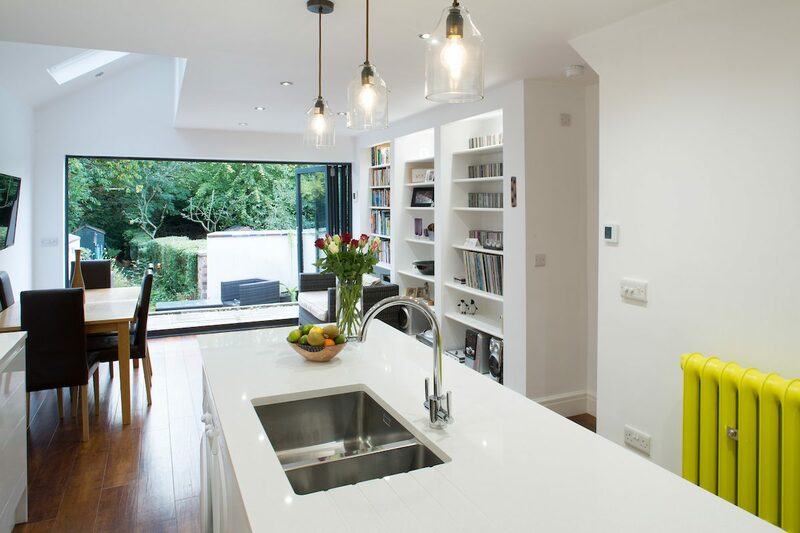 Creating a mezzanine ended up beyond the budget so Jo and Gaynor dropped this part of the project. 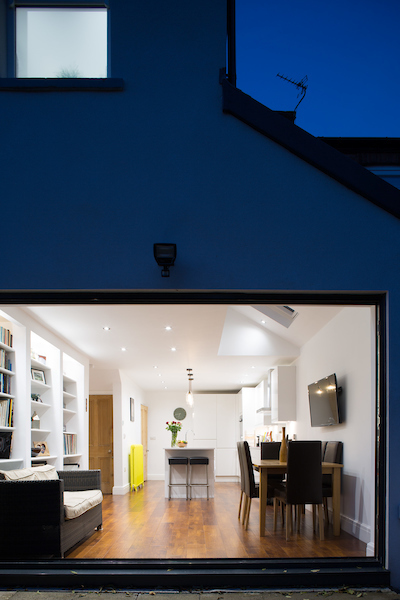 The best service delivery – the side extension is finished! 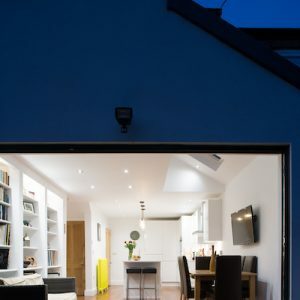 Finding out exactly what you want to be done with your house is of course only the first step. At Pride Road, we support you throughout your project. In this case, it all started in Stage 1, where Magda started with the hand-drawn plans at 1:50 scale. Alan did the survey in Stage 2 and our team produced the CAD drawings of the proposed and Existing Plan under his professional eye. In Stage 3, the plans go to the final detail phase where we were assisted by the Structural Engineer Toby Savage and the Building Control Officer. When it comes to planning and building regulations, Alan is a true professional with his fantastic focus and a keen eye for detail. 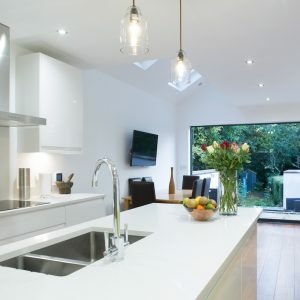 Our team always deliver a top-notch job at every stage of the project! And we are delighted that Gaynor and Jo are delighted! Click here to book our free consultation! Once the green garden is there, its worth having a grand door to enjoy it. It was an interesting project to take part. Everyone can see the difference. 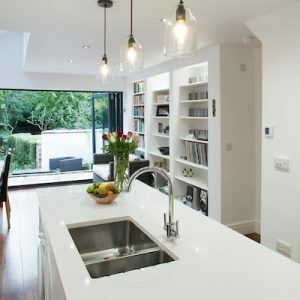 This is the transformation from a small Victorian Terrace to an open space kitchen diner with the Sofa and a library to enjoy. 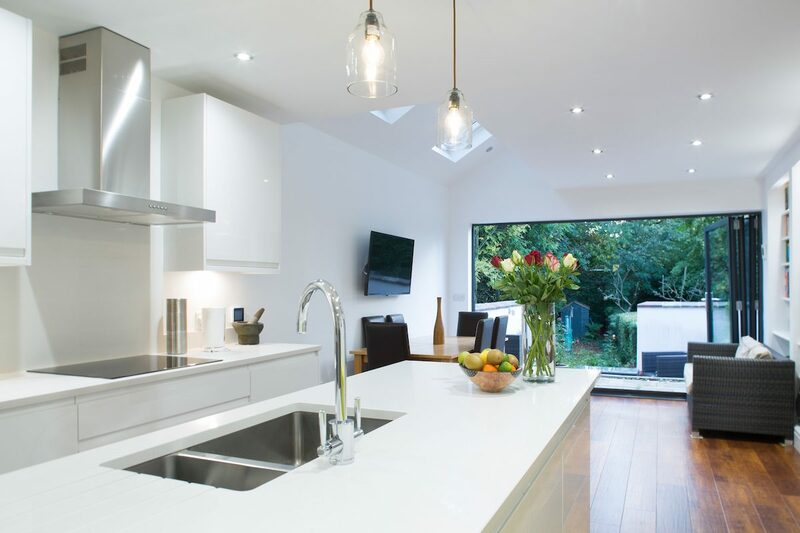 The grand kitchen for those that love to cook!